California’s advanced energy economy sector is creating 15,000 new jobs annually. Additionally, 215,000 middle-skill workers in the California's energy, construction and utilities sector need new skills to keep up with the pace of technology. Not surprisingly, automation is rapidly changing the skills required for many jobs and creating workforce barriers to economic growth. That's a workforce challenge which drew dozens of community college educators and industry experts to Folsom, California this month to talk about responding to that challenge. "It was really important that faculty learn from industry experts and from each other," said Jim Caldwell, sector navigator for the California Community Colleges Energy, Construction, and Utilities Sector. "Over time, we must develop a system where our faculty is communicating much deeper levels of automation content to the current and future workforce." 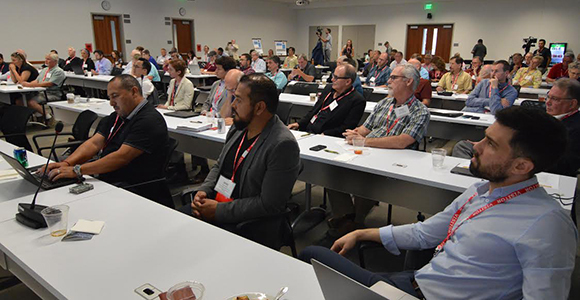 The two-day symposium was held at the California Independent System Operator (Cal-ISO), which provides access to the state's transmission grid and manages California’s wholesale electricity market. "Community colleges are very well positioned to deal with automation, facility management, energy efficiency, and analytics," said Gregg Ander, the energy policy consultant who moderated the symposium. "We need trained people in the sector and we need them quickly." Meeting California’s Clean Energy and Pollution Reduction Act goals is a critical part of the workforce challenge. For example, it’s estimated that 50 percent of the state’s commercial heating, ventilation and air-conditioning systems are improperly installed and maintained, resulting in poor carbon footprints. Major improvements are possible through building automation, which requires sophisticated new workforce skills. "This industry is booming — day and night it's growing," said Von Lawson, dean of business and career technical education at Santiago Canyon College in Orange. "Automation and control systems are going to advance so fast over the next few years that we have to be on the forefront of what is happening to prepare students for those changes." For Danielle Robinson, a sustainability fellow at the College of Marin, this fast-growing sector provides opportunity for young people in a very exciting and well-compensated area. "Students are looking at jobs that will get them into the energy sector, into engineering and research," said Robinson. "It's important that educators understand the demand and develop short-term opportunities that will help get students where they want to go." The California Community Colleges' Strong Workforce Program was established to help California meet the workforce challenges of the 21st century. Caldwell and his team are working in one of the state's most dynamic sectors to create programs that both re-train existing workers and prepare new workers. "We need a cadre of workers ready to deal with the changes in this sector," said Caldwell. "The two-day event in Folsom reminded all of us of the importance to stay alert to how automation and technology are impacting the sector and to be nimble in how we adjust courses at the state's community colleges to address those dynamics." The California Economic Summit has recognized that improving the state's workforce is a critical challenge that California must meet in order to maintain its global economic leadership. The Summit supported the creation and implementation of the Strong Workforce Program. The Summit network of public-, private-, and civic-sector leaders has championed initiatives aimed at the triple bottom line: seeking to simultaneously advance economic growth, ensure environmental quality, and provide opportunity for all. The 2018 Summit will be held November 15-16 in Santa Rosa. (Info and Registration).